This book was introduced by an office colleague and friend, Ate Fina. At first, it was kinda boring, because of the numerous facts it was laying down to the reader. But as soon as I read along, I found the inside-the-SC stories captivating and shocking at times. The decisions and the politics behind those decisions intrigued me. I'm already halfway and I'm really excited with all the other things the book has in store for me. I hope you find time reading this too. Okay, so I'm already done with the book (after a week of posting the italicized narrative above). 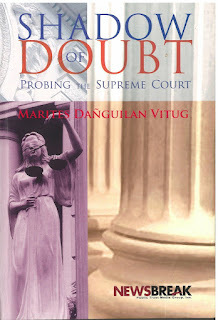 As I have said, Ms. Vitug's Shadow of Doubt has a lot of inside-the-Court stories to offer. The stories, through corroboration from different Court insiders would harbor a different perspective for a reader, at least that's happened to me. I tried to be as objective as I can when I started reading the book, but really the stories of betrayals, case flip-flops and veiled interests have got my blood boiling. Really. I've always had this respect for the Justices of Padre Faura-- their old age that I equal with wisdom and their calm demeanor with their desire to deliver justice in the right hands. After reading, I thought that we really have a lot to do to achieve those political and social reforms we've always dreamt of. The grime and dirt of politics have deeply permeated the institutions we should be trusting our lives with. The book lived to its purpose-- it served as an eye- opener. I just hope that it doesn't end with opening a can of worms and exposing the devils of Pandora's box to the public-- there should always be an immediate action to halt the spread of these ills lest they cause the social cancer Dr. Rizal and his cohorts battled before.